Methylxanthine, Methylpentane Citrate, Sulbutiamine, Sandalwood Extract, Yohimbine Extract, Alpha Lipoic Acid, Poly-Thyronine. DiPotassium Phosphate, Micro-crystalline Methyl Cellulose, Silicon Dioxide, Magnesium Stearate, Titanium Dioxide, FD&C Blue #1, FD&C Red #40, Gelatin. Due to the strength of Synedrex please assess your tolerance by initially taking only 1 capsule upon awakening for the first 3 days. After assessment, if effects last longer than 15 hours, consider alternating dosage to every other day. With caution, you may increase up to 2 capsules in the A.M. Do Not take more than 2 capsules daily or 12 hours prior to desired bedtime. 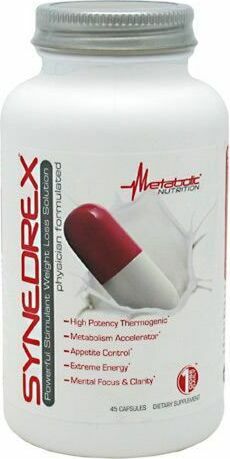 Only Thyrene and Hydravax may be combined with Synedrex for a more customized weight loss solution. NOT INTENDED FOR USE BY PERSONS UNDER 18. Do not exceed recommended dosage per day, doing so will not improve results and will result in adverse health effects. Not to be used by pregnant or nursing women or person(s) who have a pre-existing health condition, including but not limited to: high or low blood pressure, cardiac arrhythmia, stroke, heart/kidney/liver/thyroid disease, seizure disorder, psychiatric issues, diabetes, stimulant sensitivity or allergies, prostate inflammation, or while taking any other medication (such as, but not limited to: MAO-inhibitor or SSRI's). DO NOT use in combination with other stimulant products or alcohol. If you experience rapid heartbeat, dizziness, severe headache, shortness of breath, or similar symptoms, discontinue immediately and call a health care professional. DO NOT use Synedrex longer than 60 days continuously.